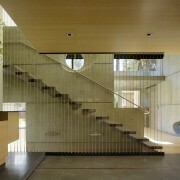 While many of us might view concrete as just another construction material, for designer FuTung Cheng it’s so much more. “Of course it can function entirely as a structural material, but for me it’s also a means of expression,” he says. 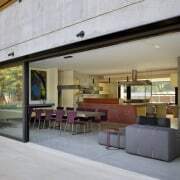 That relish in the versatility of concrete is apparent in his design of the home featured here, a 560m² family home on a 4000m² suburban site. The house itself is a cluster of five distinct structures – the two-storey main house, office, guest house, meditation centre and the garage. “I didn’t want it to be a single monolithic structure that felt overwhelming or out of scale,” he says. 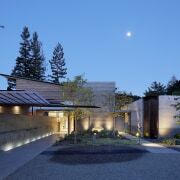 Cheng’s aesthetic approach to concrete helps mark out the different elements on the front facade, with a double-storey wall of textured, board-formed concrete used on the main house, while the single storey office is in smooth-faced concrete. 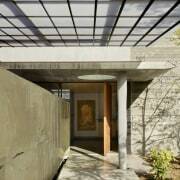 For the structural column at the front door, Cheng used a third technique. Concrete was poured on site into a polyester tube, which was then pinched at various points to create a smooth organic shape. 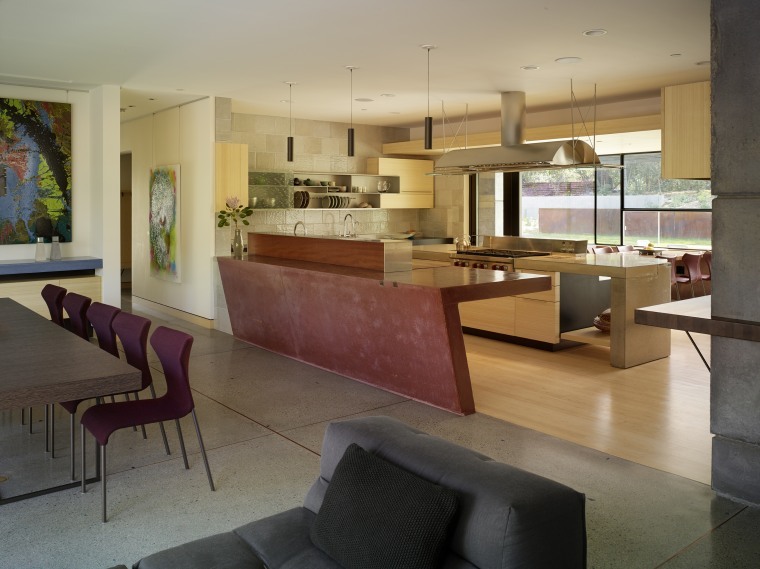 ​​​​​​​An angled, oxide red concrete island delineates this kitchen from the more formal dining area and acts as a cutting and prepping area, or as a buffet servery. 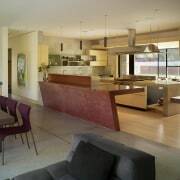 The second island houses the cooking zone and has a 7.6cm thick, bullnosed concrete benchtop that cantilevers over the cabinetry on the back side. 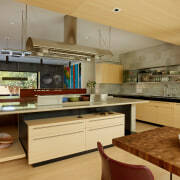 The second storey of the main house is clad in contrasting reclaimed redwood that had been felled over 100 years ago. It’s topped by a butterfly roof concealing the photovoltaic cells covering 60 per cent of its surface. The roof’s angles, pitches and pleats collect rainwater, allowing for potential water tank storage. 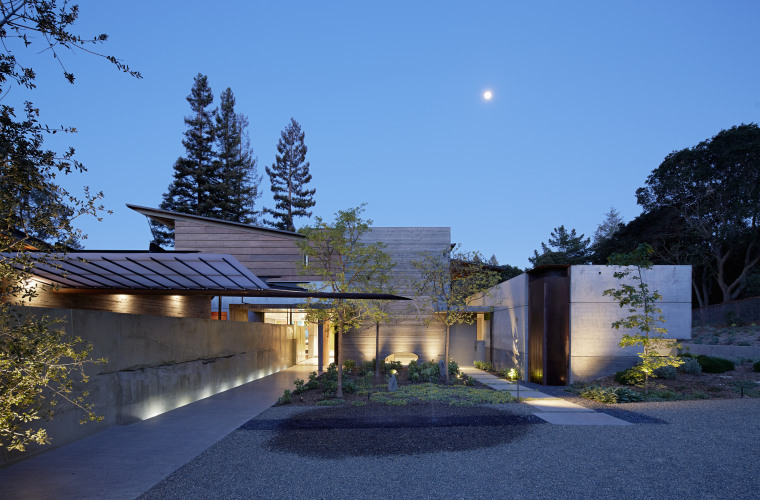 But rainwater is also channelled to form water features and to interact with some of the concrete walls to create ever-changing art installations. So, at the front of the house, a copper pipe extends over the walkway, spilling out a stream of water from the garage roof during rain showers. Meanwhile, small pumps also direct rainwater into the middle of the wall running alongside the entry approach. 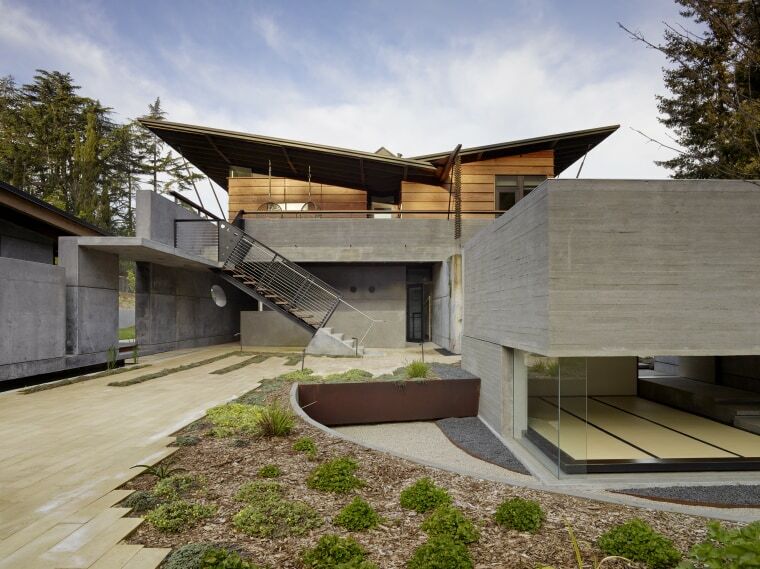 ​​​​​​​The butterfly roof design on this home conceals the photovoltaic panels that cover 60 per cent of its surface. Celerestory windows are also positioned to direct sun onto internal concrete walls that then act as a heat sink. Water from the butterfly roof creates another art installation at the back of the house. Here it is channelled along a copper beak onto a series of rain chains hanging above a concrete blade wall, which Cheng refers to as an ‘erosion’ wall. 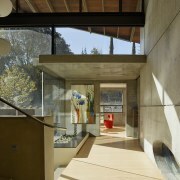 All the concrete work in the house was fabricated and detailed by the designer, often creating hands-on, spontaneous compositions.